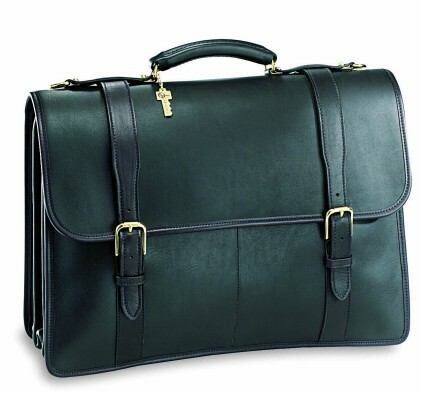 Jack Georges briefcase briefcases, attache case.. Thick soft drum dyed full grain cowhide leather soft side brief. Triple compartments which expand. Triple accordion file compartment. Solid brass combination lock on outside front flap. Inside pocket for business cards, pens etc. Two straps buckle through to secure this case in. Allows for heavy duty use. A good looker and a work horse. Shoulder strap included. Lifetime Warranty against defects. By Jack Georges. Only the best quality hardware and materials used throughout the Jack George line. That is why the workmanship makes the entire collection something that will last for years to come. Jack's designs are always thoughtfully laid out with the owner's use in mind. The end result is not only a beautiful product, but one that works well. >>> Jack Georges has a new promotion starting ..
Also all Jack Georges pricing includes Free domestic shipping and more. No sales tax if shipped to anywhere outside the state of Michigan. On-line ordering is of the highest level secure format. We also can gold hot stamp your initials at no extra charge, just specify desired initials under "Special Instructions" when placing order.